With social media and the digital are in full bloom, many question the need for business cards at all. But a need there still is. The difference between now and 10 years ago if your business card is not effective, it is a hindrance. How so? Let's take these 3 one at a time. Sounds basic, but it must have all the necessary basics on the FRONT of the card (name, phone number, title, e-mail, company name, website and in this day and age a regional address such as Kansas City, MO is fine). - More often than once I don't even see an e-mail on the card. This immediately hollers lack of professionalism. -You must have a professional e-mail (not Yahoo, Gmail, Hotmail, etc.). Again, this is a red flag that hollers lack of professionalism. If you own your own company, it immediately shows you aren't serious. -You must use the space on the back of the business card: It's too valuable and too strong a free advertisement not to include to emphasize that first impression. - Your business card should match your website, your e-mail signature and your LinkedIn profile. Colors are good, photos are good- if that's your thing- but the idea is "branding." Repetition, repetition and repetition. In my case, I gladly like being known as the "I just got a job in sales! Now what?" (title of first book) guy and the "I've been in sales for 10 years! Now what?" guy (title of second book). 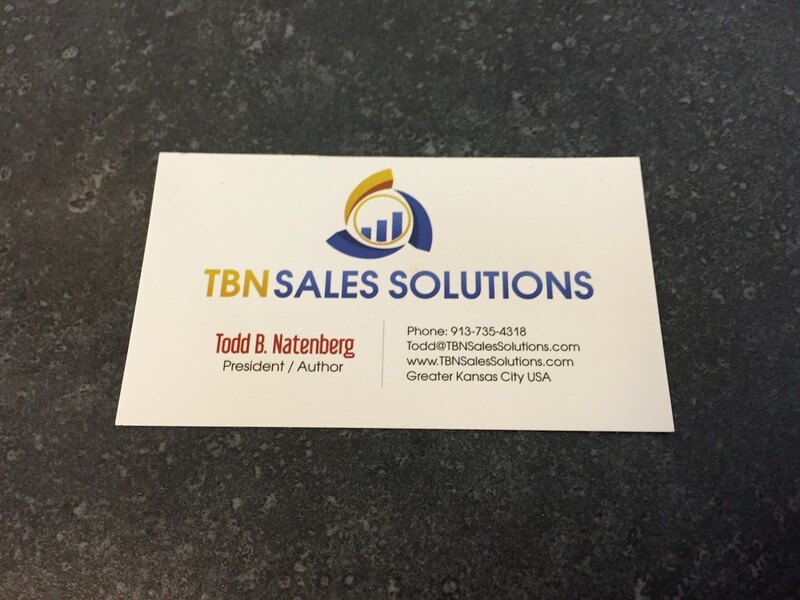 -The back of my business card has my benefit statement, a picture of my latest book cover, and our motto- "Are your sales people busy or are the productive?" Cards that don't have phone numbers, e-mails or websites- being upfront- I toss them instantly. If someone doesn't get the basics, while I appreciate where they are at, they aren't a good lead, referral source or even someone that I can truly help. That's what the business card is truly for: Helping others. Hey, isn't that what sales is all about?